As we’ve reported, Disney’s Animal Kingdom is marking its 20th Anniversary this month, marking April 22nd, 1998, the day that “a new species of theme park” started educating guests on the wonder of nature. 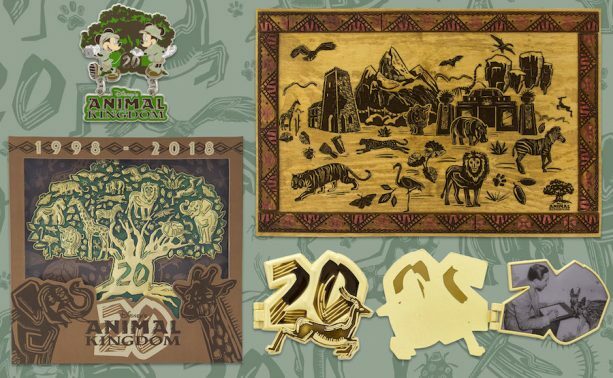 Like any big event that happens throughout the Walt Disney World Resort, it needs to be celebrated with a new line of merchandise and what better way to celebrate Disney’s Animal Kingdom than with their iconic centerpiece the focal point of all of it? Artists drew more than 50 animals, icons, and graphics to represent and tie in many aspects from the parks, such as a banshee from Pandora – The World of Avatar, to the Boabab tree from the Kilimanjaro Safaris. To give the merchandise a specific look, developers pulled from an artwork style guide. They gave both old and new attractions a nod while detailing the transformation the park has gone through over the last 20 years. You can find merchandise at the headquarters of the event, Island Mercantile, while other shops will have assortments of the new items. This includes apparel for adults and kids, accessories and jewelry by ALEX AND ANI, and collectibles like trading pins. If you’d like to see some of what will be offered for the 20th Anniversary, reference to our previous article where we showcased mugs, t-shirts, ornaments, and the MagicBand! What do you think of the new merchandise being offered? Do you think it accurately represents the evolution of Disney’s Animal Kingdom over the past 20 years?